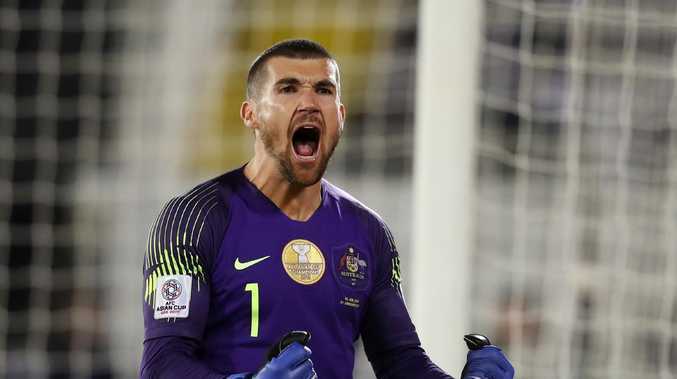 Socceroos goalkeeper Mat Ryan helped Australia through to the Asian Cup quarter-finals. 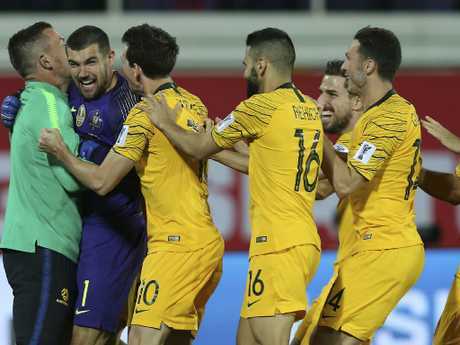 MAT Ryan's nerves of steel have propelled the Socceroos past Uzbekistan on penalties and into the Asian Cup quarter-finals. Ryan made two terrific saves in Monday night's 4-2 shootout win, paving the way for Mat Leckie to bury the decisive spot kick on return from a hamstring injury and set up a last-eight date with either host nation the United Arab Emirates or Kyrgyzstan. 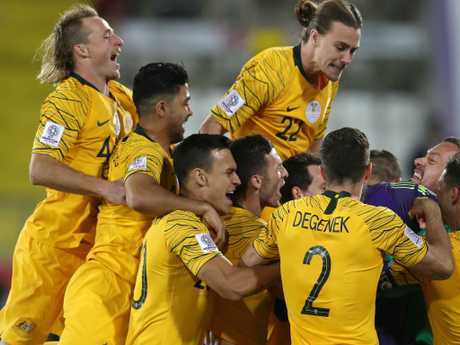 It came after a largely toothless Australia couldn't break the round-of-16 stalemate over 120 minutes despite their 17 shots to Uzbekistan's seven, sending their tournament defence down to the dreaded lottery. 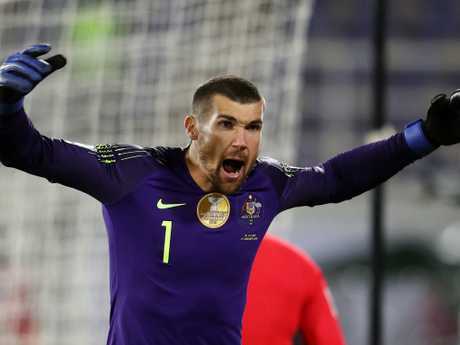 Mat Ryan was instrumental in Australia’s win. 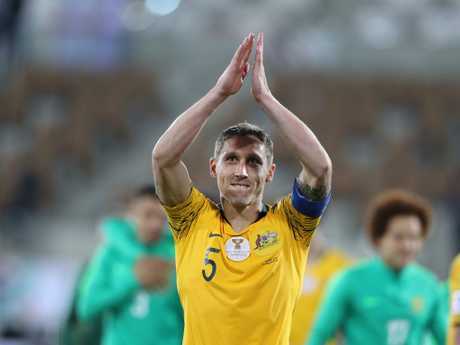 With everything on the line, captain Mark Milligan scored Australia's first penalty, though Uzbekistan goalkeeper Ignatiy Nesterov got a hand to it, before Otabek Shukurov levelled the ledger. All then seemed lost when Aziz Behich was denied by Nesterov, only for Ryan to stand tall and stop Islom Tukhtakhujaev. Robbie Kruse then buried his in the roof of the net and Ikromjon Alibaev and Apolostolos Giannou followed suit, before Ryan denied Marat Bikmaev to set Leckie up for the winner. It got Graham Arnold's men out of jail, but they will have to improve on their performance at Al Ain's Khalifa bin Zayed Stadium, where they lacked attacking edge, cohesion and passing accuracy in the first half and were lucky weak defensive moments did not spell the end of their campaign. Australian players celebrate with their goalkeeper Mat Ryan. And their task is set to get more difficult from here as the defending champions must now get by without suspended Tom Rogic after the in-form playmaker was shown his second yellow card of the tournament for accidentally stepping on an opponent's foot. History was on Australia's side, having now won all four meetings without conceding a goal, including that 6-0 in the 2011 Asian Cup semi-final belting. But the White Wolves have been on the rise since then, and manager Hector Cuper did his homework and set his side up to nullify Awer Mabil and Chris Ikonomidis. And it was worrying how easily Eldor Shomurodov was allowed into space to very nearly score 10 minutes in. Mark Milligan celebrates as the Australians sent Uzbekistan out of the tournament. The 23-year-old striker, who has four goals from the three group games, was played in on the left and shimmied straight past Trent Sainsbury before rounding on Ryan, who did well to block the one-on-one shot and pounce on the spill to save his teammate's blushes. 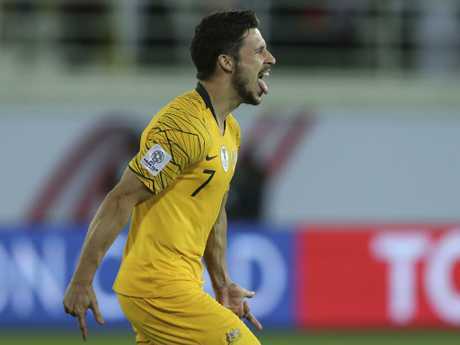 Behich got Australia's first real shot away from distance a couple of minutes later but Uzbekistan's fluid movement and high pressing unsettled the Socceroos. Rogic wasn't nearly as influential as his outings against Palestine and Syria, and the Celtic man was pinned early by card-happy referee Abdulrahman Al-Jassim for treading on the foot of Jaloliddin Masharipov as he attempted a nutmeg. Mat Leckie made a welcome return to the team. Australia kept looking for a gap but, in doing so, left themselves vulnerable to Uzbekistan's rapid breaks. Masharipov in particular was a menace, prancing trickily past defenders and squaring for Javokhir Sidikov, who unleashed a low pile-driver that skimmed the outside of the upright. And it was fortunate that Dostonbek Khamdamov sent a long-range effort high given the ease with which Shomurodov had again blazed down the left. The Aussies scraped through after a largely lacklustre performance. After the break Davron Khashimov was yellow-carded for a nasty-looking challenge on Behich. There were also signs of life from the Socceroos as Mabil found pockets on the right and Rhyan Grant had two massive chances - a first header was easily saved before the right-back diverted another would-be goal high off a promising run from a Mark Milligan ball. The distinct lack of a crowd, save for an enthusiastic drum-beating Uzbek contingent, meant the entire stadium heard Arnold bellow "Leckie" in the direction of the warm-up area. And in the 68th minute, Leckie ran on for his first tournament minutes with the view to save the day. Uzbekistan players show their disappointment after their defeat at the hands of Australia. A few minutes later and the experienced forward very nearly did via a long-range drive that sailed past a swarm of defenders but was awkwardly saved by Nesterov. It came moments after Nesterov had palmed away a similar Rogic shot, but Australia was awake. And Leckie's impact was immediate, weaving this way and that and dribbling into the box to be denied again. The repeated profligacy almost came back to bite them when, four minutes from regulation time, Uzbekistan found a second wind and stalwart skipper Odil Akhmedov skewed a cross only slightly wide. 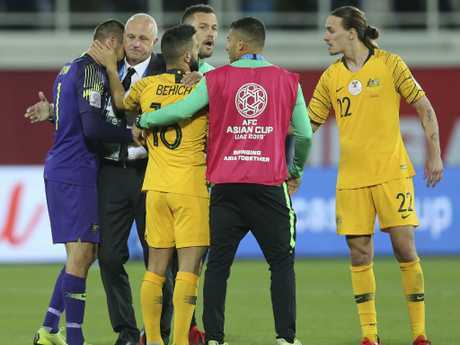 Australia's head coach Graham Arnold, second left, hugs his goalkeeper Mat Ryan. Both sides held on for extra-time but, though Australia came close a number of times, neither could break the deadlock as the contest descended into a scrap. Both sides held on for extra-time but, though Australia came close a number of times, neither could break the stalemate as the contest descended into a scrap.